It's been a long time, I know. 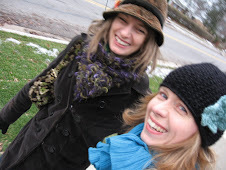 The VV sisters have had a busy year... work, cats, snow... well, that's my excuse anyway. But I have been knitting in my spare moments. In fact, this winter has been so cruel that I have become a total home body and spend much of my time curled up in front of a movie or British tv program, knitting away. So, here I am, at long last, sharing a few of my projects.